Slots bearing fruit symbols or having general fruity themes are found the world over. Why should Playtech's Fruit Mania be any different. Well, in honesty it shouldn't. Just because fruit games are found all over the world doesn't mean that they are all the same. 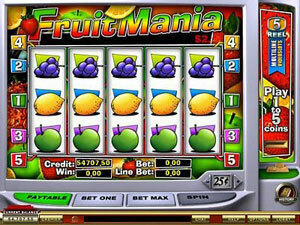 Fruit Mania is a five reel and five pay line slot machine. Deliciously looking, very simple to play and a whopping payout are it's trademarks. Fruit Mania is featured on many casinos across the net that are powered by Playtech, although granted as is the case with most of these slot games lately, no U.S. Based players are allowed to partake in this fruity fantastic fun. The jackpot on Fruit Mania is a guaranteed £1,250. Yes, I said jackpot, who knows or dares to dream what your spins could take you too at any given moment! In order to win the progressive jackpot, you're going to have to accumulate five cherries on the fifth pay line, so hopefully you will have it activated or guess what? No jackpot! But there are more things to win that the jackpot however. Matching up a combination of apples, grapes, lemons, peaches, plums and strawberries in any one of 28 different winning combinations could see you still achieve a respectable pay out, even if it is not the progressive jackpot. 5 plums for instance would see you £625 to the richer, whilst a collection of 5 oranges itself is worth £250. No slot machine would be complete without either a bonus game, a scatter card or a wild card and Fruit Mania has two of these three additional features incorporated into the game. Fruit Mania also features a cocktail glass symbol which stands for a scatter card. Collect three, four or five of these cocktail glasses and your stake will multiply by five, forty and five hundred respectively. There may not be any wild cards, but Fruit Mania does feature a bonus game. Collect three or more Sun symbols on any pay line any you can begin a bonus game. The Fruit Mania bonus game is simple enough, simply pick three fruits from the lines provided to earn a prize. With the maximum stake being a measly £1.25 for all five lines, you can hardly go too wrong can you? Fruit Mania is a no download game, and for such a small price, such a large fee can be yours! If you're feeling fruity, why don't you have a go. It isn't all apples and oranges you know!